The Aged Brass ModernRail Pendant by Tech Lighting showcases the sophistication of ModernRail but with all of the simplicity of an elegant pendant. 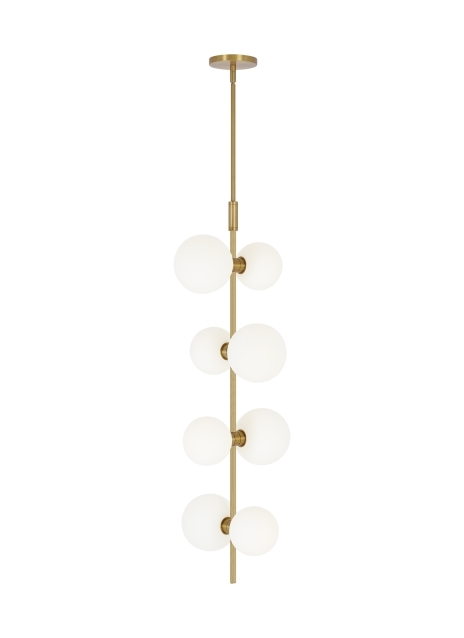 This Aged Brass ModernRail pendant features optional frosted opal glass globes or cylinders that gracefully wrap around the center rail allowing light to illuminate generously into surrounding spaces. Scaling at 3” in length and 12” in diameter this gorgeous pendant is ideal for hallways, foyers and bedrooms. The integrated LED globes or cylinders are fully dimmable to create the desired ambiance in your unique space. With its classic Aged Brass finish and uniquely crafted design the ModernRail Pendant light is sure to add a touch of sophistication to any space. Ships with (8) 24 volt, 3 watt, 220 delivered lumens (1760 total delivered lumens), 3000K, integrated LED modules. Dimmable with most LED compatible ELV and TRIAC dimmers. Ships with (2) 6" stems and (4) 12" stems in coordinating finish. Remote Power Supply version T24.